We're guessing the worst thing that could happen to you if you are a student working on an assignment is that you spend hours pounding away on the keyboard at home and when you bring the file in to the university on your memory stick or on a CD, the file cannot be opened. We know this because we have seen many students come to the Learning Resource Centre in such a predicament. But there is a simple way to avoid this from happening. 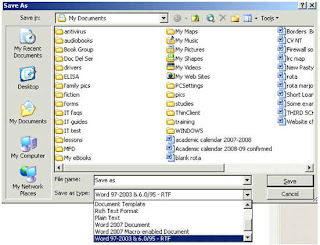 Word processing applications such as Microsoft Word 97, 2003 or 2007, Open Office, Microsoft Works and such like contain an option that would make transferring your work from your home computer or laptop to the university as easy as ABC.